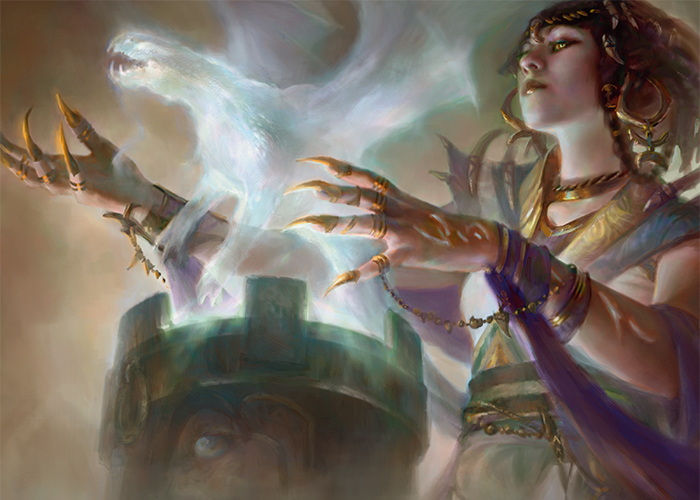 I’m writing this article mostly because I just saw Dig Through Time’s price and noticed that one of most powerful card selection spells in Standard reached its bottom in terms of price. Besides Standard, the card has burst onto the eternal scene and completely changed Legacy (it was already way too good for Modern, and along with Treasure Cruise quickly received the ban hammer). There has even been talk that this card should be banned in Legacy, right along with Treasure Cruise, because it just makes blue decks way too good – especially combo oriented decks like Omni-Tell, where if you have your combo countered initially you can just use all the trashed pieces in your graveyard to dig for another Show and Tell and Omniscience and still win even through an absurd amount of counter magic or hand disruption. For control decks, it makes them even more oppressive because they can also keep going through their deck until they again find a way to lock down whatever you’re trying to do again and again. Now, Standard obviously can’t abuse Dig and Treasure Cruise like eternal formats. Even if they became more oppressive in the environment, because of the changes to the block structure Khans and Fate Reforged are going to rotate out earlier than they would previously (they rotate once the next large set after Battle for Zendikar is released). This means that there will be a smaller window for profit once we get into the accelerated Standard rotation window if cards like Dig become great. 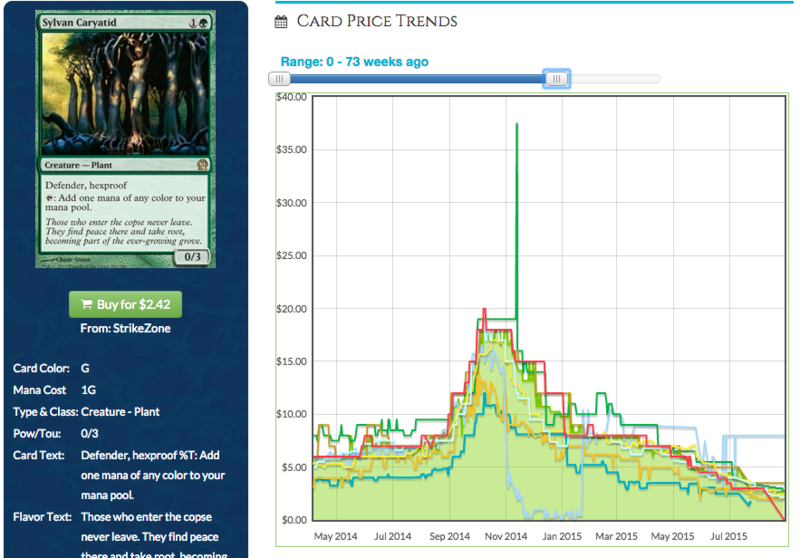 Picking cards before release should also become more profitable (or costly) depending on how good you are at it. For Magic Origins, many of the writers for MTGPrice were able to identify the vast majority of undervalued cards going into the set release so I highly recommend you follow authors like Derek Madlem, James Chillcott, and Travis Allen (if you have premium) so that you are better able to see which cards are undervalued. This way, you can make more informed decisions when it comes time to preorder if you like to add risk to your portfolio. Besides preordering though, another way to profit on Standard cards is to pick up staples in the current block at undervalued prices before as rotation approaches. Of course, the counterpoint to this is to pick up undervalued casual or eternal cards in the rotating block, but here I would like to focus on cards in the current block that I feel have reached a bottom and have room to grow as Battle for Zendikar is released. My strongest pick for value, both in terms of card selection and the current market price of the card, I would suggest that if you are a Standard player to finish your playset in the near future and if you want to speculate on the new Standard to pick up as many copies as you are comfortable holding. I think that this card is at least doubling up once rotation happens, and I wouldn’t be surprised if it headed to $15 or higher for a short period. Another card that has reached a low point, this seems to be the direction that Wizards is taking Wrath of God cards. I believe that Standard players are going to be attracted to using it because a four mana board wipe that kills basically everything is the hotness. I especially think it will be a good pickup because Abzan is already an established boogeyman of the format and everyone will be playing aggro decks during the release of Battle for Zendikar to punish the slower decks. Well, this is an aggro punisher if I ever saw one! I admit though, as Standard goes on I think that Languish will get worse and worse because I’m expecting some super large Eldrazi to come out of the next two sets (I mean, we might even see something bigger than Emrakul!) and Languish isn’t even coming close to killing them. I think the play here is to pick up copies now, and then get rid of extras once a spike happens because I don’t think it has a chance of a second spike during its Standard life. The lynchpin of the current Abzan strategies, these cards were hit hard by the Clash Pack printing but should rebound nicely as rotation happens in the fall. We’re not going to see $10 Rhinos or $9 Dromoka Commands again but they each should go back up to at least $6, since I believe that many players are going to want tools to fight against Burn and super fast decks as the new Standard is being figured out. Also, both are applicable to Modern and should be buoyed financially if even they don’t experience a major spike in Standard. 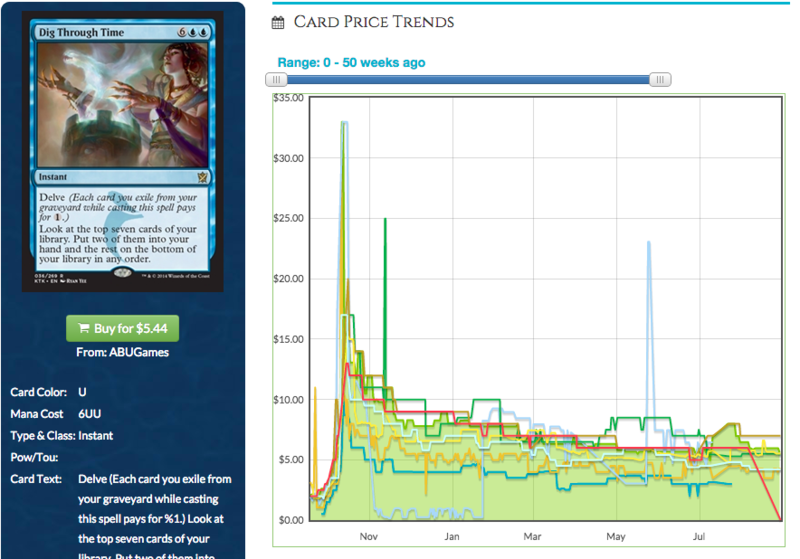 If you are looking for long term value, I think that since Siege Rhino and Dromoka’s Command were reprinted that both are good places to park some dollars in expectation of future gains, since they both have dropped in price considerably and have eternal application. I’ve always ascribed to the philosophy that aggro tends to dominate Standard during the time of rotation, and this is a two-drop mythic rare that could fit nicely into a newly envisioned mono-red aggro deck. Another interesting possibility is its inclusion in a midrange deck which is able to take advantage of the Formidable ability, so you can generate 4/4 Dragons as the game goes on. Either way, for $2 you won’t be losing much if this doesn’t make a splash and have everything to gain if it does. On the plus side, Dragons of Tarkir will actually be Standard legal longer than Khans and Fate Reforged, so there is actually another rotation where this will be legal to see a spike. So you actually get two chances with this card to see a spike! Well, you know what they say, it’s always the quiet ones you need to watch out for… looks like both Whisper cards have hit their bottoms, and both being mythic rares means that if they spike then the price is going to go up higher and faster than their rare equivalents. Whisperwood being green means that he’ll be better able to fit into ramp strategies, which I think players are going to experiment with once we get some large and imposing Eldrazis to work with in Standard. Whisperwood can keep generating 2/2’s as blockers to keep you alive until you get some Eldrazi online. Seems like a great card to me and I have big expectations for this guy. I’ve been hyping the Rattleclaw Mystic money train for a while, and I’ve picked up plenty of excess copies of this guy in anticipation of a decent performance in Standard since this is predicted to be the best mana ramp creature we’re going to get. Going with what we’ve seen from Sylvan Caryatid, I expect Rattleclaw to start going up in price some time in October. Caryatid went from $5 to $15 in October, so going with Rattleclaw’s current price of $2 I expect it to be at least $6 by the time October hits. Wait a second, you say. How could these things possibl0y go even higher than they are now? Didn’t Polluted Delta and Flooded Strand recently see a significant appreciation in their price? Despite both of these questions being valid concerns, fetchlands are in a league of their own when it comes to price and will be especially important to Standard since Landfall is being reintroduced in the coming-back-to-Zendikar block again. I wouldn’t be surprised at all if the Khans fetchlands go over $20 retail in their Standard life, with the most heavily played ones reaching $30 or more. We also have to consider that Modern will be driving demand in addition to Standard, since we just saw a spike of the original Zendikar fetchlands because of Maro letting us know that we have an “exciting” new type of dual land coming out shortly… mhmm, I think I’ll keep my excitement in check until I see those original Zendikar fetchlands reprinted again, mkay? While the fetches have been trending up nicely over the summer, especially the blue ones, I still think they have room to grow before they rotate from Standard. I wouldn’t expect to get killer deals on these things near or after rotation – remember, everyone is going to be looking to pick them up at rotation so retailers aren’t going to be budging on prices much. While the best time to purchase fetchlands is behind us, I still think it is a good idea to complete unfinished playsets before Standard and Modern hype start bringing the Khans fetchlands to lofty new price highs. That’s all I’ve got for this week! Which cards are you guys looking at in Standard that have reached their bottoms for some nice fall gains? I know I only covered non-rotating cards, so is there anything from Theros that you think is even more important to keep an eye on than Khans/Dragons/Origins? I have some concerns that Abzan may struggle a lot after rotation, because it loses a lot. I’d rather figure out which deck-types have staying power or which types could emerge. That being said, I think Sorin and Sarkhan (not the Temur dude) may fill some vacant spots (unless we get more awesome new walkers like Gideon). Having a few copies of them doesn’t seem too wrong. Other than that I still wait for the complete spoilers to make any daring claims. For those who are interested, I am testing “Selesnya Scales” right now with Hangarback Walker, Managorger Hydra and Hardened Scales. Other important cards are Evolutionary Leap, Dromoka’s Command and to a lesser extend Murder Investigation (as a second Hangarback-Walker-esque effect). I’m still unsure about splashing B for Abzan Ascendancy and removal, though.